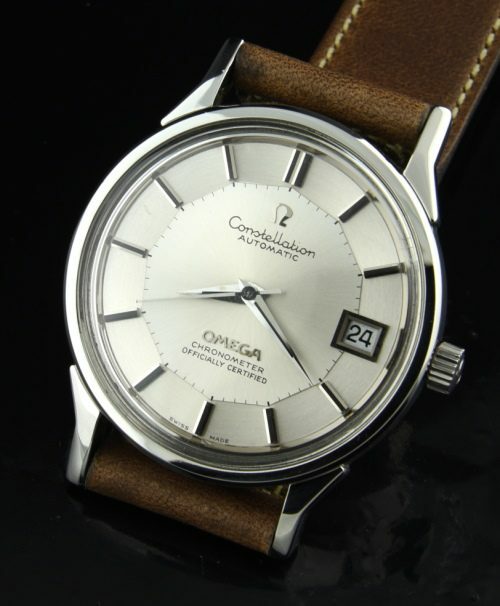 This is a very RARE OMEGA PIE-PAN CONSTELLATION dating to 1973. I DO NOT use the word rare often. This one really is. Most would say that the Pie-Pan dial never existed in the 70’s, but it is true it exists. You can do your internet research and discover this model ref. 168.0065 with caliber 1011 chronometer grade movement appears and only a few examples discovered around the world. The original OMEGA chronometer grade movement (adjusted to 5 positions and temperatures) is running smoothly. The original Pie-Pan dial is slightly flatter and the original Dauphine hands are present. Notice the raised OMEGA wording located on the lower portion of the dial instead of the top-only seen on this RARE OMEGA version. The original dial looks amazing. The hesalite OMEGA crystal is present. This OMEGA crown is completely original and correct to the watch as is documented on the net with other examples discovered. The 34mm. stainless steel case on this watch is shimmering. The Omega Museum recently posted this reference on their OMEGA website, as it had not appeared until recently. You have to see this watch on the wrist. The flatter profile of the pie-pan dial with sharp edges really catches the light-amazing! No other pie-pan looks like this. An investment grade OMEGA which I highly recommend. I own one myself. If you were interested in one of these I have one more of these remaining. Please contact me.